When I was little, I was very curious, I was a messer, I liked to invent things, and I liked strange gadgets. Our Malcolm has inherited all of these traits, for better or for worse. I used to beg my parents for odd devices from cooking catalogs, and they’ve all ended in a jumble in a drawer in my kitchen. It should come as no surprise that Malcolm likes to go through the drawer. 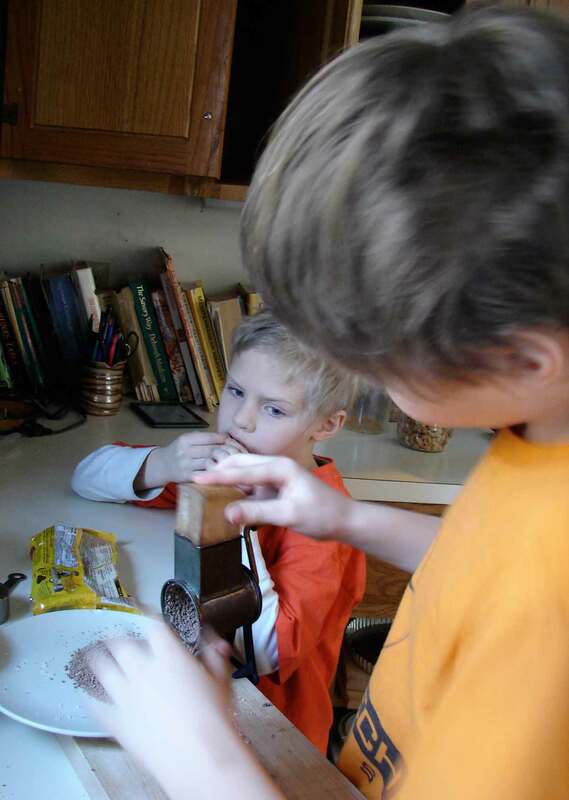 He had the day off school, Monday, and I found him in the kitchen playing with two ancient hand-cranked graters. (Why did I have two? I don’t know! I don’t even remember what I used them for!) Malcolm’s plan was to grate crackers into the dog’s bowl. My first reaction was of terrible iration (shouldn’t that be a word?!?!) And then I said, no, let’s actually use the grater, to grate food that according to my foggy memory, it was designed to grate. So he grated some almonds. And then he used his messer-ingenuity to devise a method of attaching the grater to a cutting board for more control. And then he grated hazelnuts. And then I said, ah yes! I remember it can be used for chocolate. So he grated chocolate. It was such good fun! And he created mounds of lovely soft, fine nuts and chocolate. We decided to make cookies. Or cakes. Cookie-cakes! And as we sat eating them after dinner, I realized that it was Monday, not Sunday, so the homework we planned to put off because it wasn’t due till Tuesday was due the next day…and that brings us to “pro-social others.” As part of Malcolm’s drug awareness and education class, we do worksheets together as a family. (I should start by saying that I’m glad he’s taking the class and I’m fine with the group activity-quality of it all! Although I don’t see why they can’t just have an assembly with a taciturn policeman showing slides of OD corpses and cocaine-ravaged septums, like when we were young. You know it worked because nobody in my high school ever did drugs.) The language of the worksheets is often very jargonny and difficult to wade through for meaning, but they’re so earnestly well-intentioned that it’s hard to be critical. And some of the scenarios are a little advanced for a ten-year-old, (I can’t imagine him shopping by himself at a mall any time soon!) but that’s okay, they’re starting early. But this phrase, pro-social others, it really bothers me!! I’m no fan of the redundantly, sales-gimmicky, self-help-y word “proactive,” but pro-social seems to have more meaning than that. Apparently it came about in the 80s (did anything good come out of the 80s?) as an antonym for anti-social. It means altruistic, other-oriented, helpful, intended to create social acceptance and friendship. Lord, I love the idea of altruism and helpfulness. I’d like to imagine and encourage such a society, I’d like Malcolm to join the ranks of happy friendly people. But “pro-social others” sounds so robotic, so unfriendly and inhuman. It sounds like a phrase invented to fool us into forgetting the real words. It sounds as if you can somehow control who your children become friends with, or order them perfect, socially accepted friends from a catalog. I genuinely hope that Malcolm doesn’t ever do drugs. He’s so curious and fearless that I worry for him, sometimes. I hope he’s strong enough in himself to resist peer pressure. But surely part of that is to encourage a little bit of rebel in him, to applaud the ability to question convention and to make the decision to be anti-social when the society you find yourself in is unkind or dangerous. It’s funny how everything these days seems to boil down to my wish for my boys. I love to see them with their friends, walking slowly, heads inclined toward each other as they discuss some serious mystery; leaping happily in the air on the street corner before school, pumping their arms and trying to get trucks to honk. Of course my wish for them is to have many friends, and to have interesting friends, and to have good friends. I hope they’ll be strong enough to help friends out of trouble rather than follow them into it. I hope they’ll be able to side-step pettiness and meanness. I hope they’ll experiment with paint or pastry dough instead of hard drugs. I hope they never have an aching empty hole they feel they can’t fill. As we sat discussing the worksheet, and I told Malcolm I hope he won’t ever do drugs, he pointed to my glass of wine, with a smile. “You drive me to it lad!” I yelled! No I didn’t, of course I didn’t. I said, “well, it’s social, and legal, and in moderation.” And he said he hoped that he could have a glass of wine with us someday. And I do, too! I look forward to that as well. To making a dinner with Malcolm, who is always the most fun to cook with, and having a glass of wine, and hearing about his life, wherever in the world it takes him, and hearing about the people that he loves and that love him! Cream the butter until light and fluffy. Stir in the powdered sugar, and then beat in the eggs, one at a time. Beat in the vanilla. 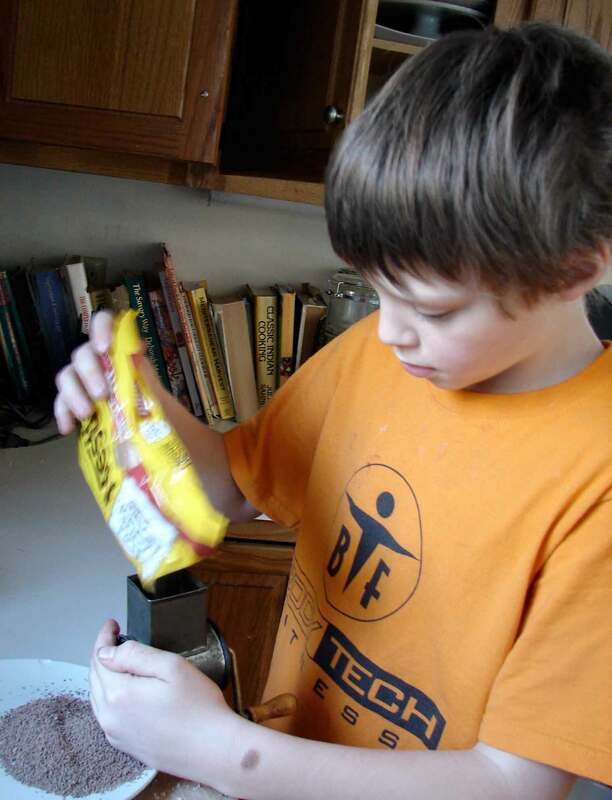 Add the flour, salt, baking powder, baking soda and cinnamon, and beat until well-mixed. Stir in the nuts, chocolate and chocolate chips. You should have a fairly stiff dough at this point. Stir in the condensed milk. The batter should still be fairly thick, but soft and easy to stir. Lightly butter two baking sheets. Drop the batter by heaping tablespoonfuls onto the sheet, leaving a few inches around each, because they will flatten and spread out. 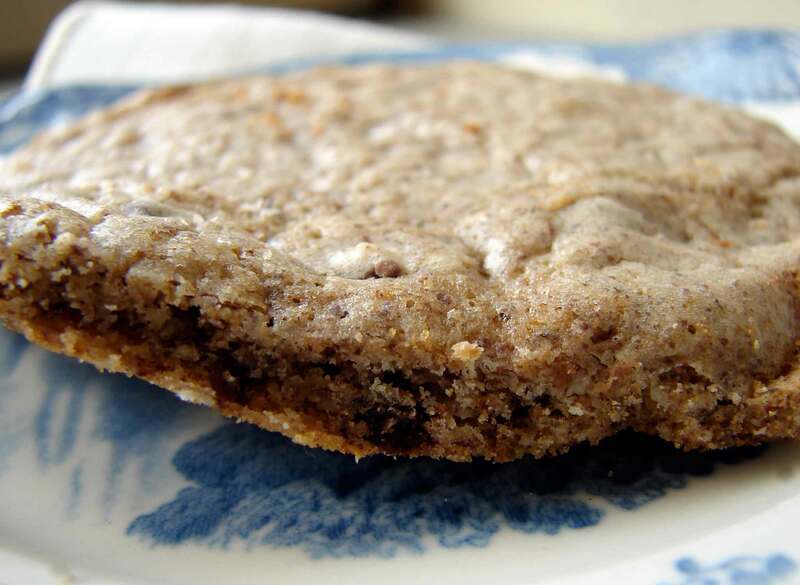 We made them quite big, because Malcolm wanted them to be like little cakes, but you could easily make them smaller, more like regular cookies. Bake for 10 – 15 minutes until they’re lightly browned on the bottom. Move to a cooling rack. 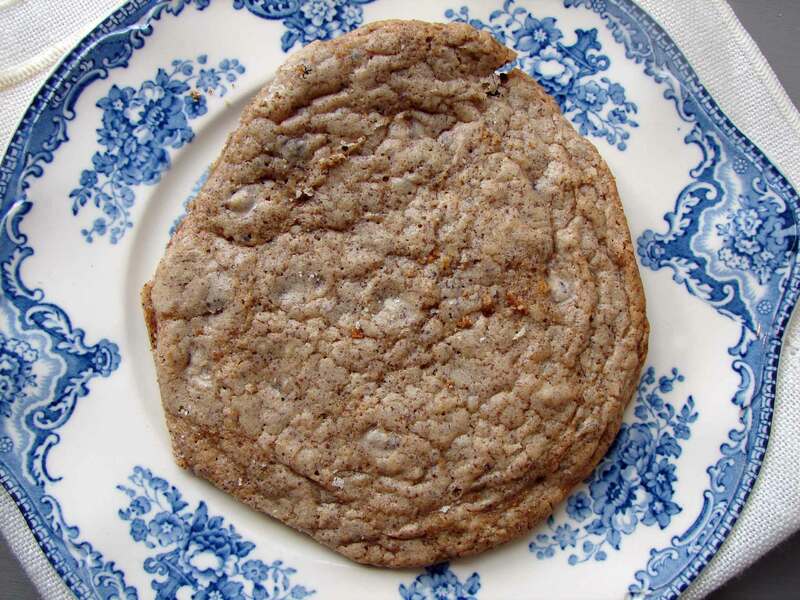 This entry was posted in chocolate, cookie, recipe and tagged almond hazelnut cookie, cooking with kids, hazelnut chocolate cookie, shaved chocolate by Claire. Bookmark the permalink.